Acid reflux, sometimes known as GERD (Gastroesophageal reflux disease), is a chronic condition that irritates the esophagus. 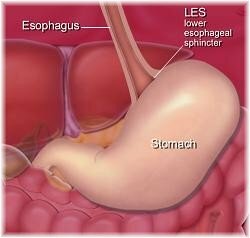 We all have what is called a lower esophageal sphincter, or LES. Whatever you swallow (food, drink, candy, saliva, etc.) all of that travels down its way through the esophagus into the stomach. As you swallow, the LES opens up allowing those contents to reach your stomach. After those contents reaches your stomach, strong acids and enzymes called gastric juice begin to produce to aid your body in food digestion. The LES is supposed to protect your esophagus from these acids and enzymes. It protects the esophagus by closing as soon as the last little bit of anything you swallow gets into the stomach. Now, you're probably asking, "What does this have to do with GERD?" People with acid reflux sometimes have a weak lower esophageal sphincter. Depending on what you eat, or drink the LES weakens. When this happens it allows the acid to travel back into your esophagus. When this acid travels back into your esophagus, most of the time you feel a bad burning sensation around the chest area. That burning sensation you feel is more commonly known as heartburn. Now, heartburn is something most people experience from time to time. When you experience heartburn on a consistent basis (like two or more days a week), that’s when things get to be a bit more serious. 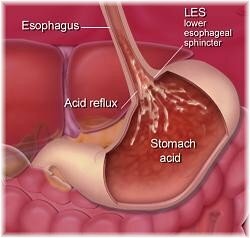 Acid reflux is the condition in which stomach acid travels back (refluxes) into your esophagus. Heartburn is that burning sensation you feel when this acid comes in contact with the lining of your esophagus. GERD (Gastroesophageal reflux disease) is a more chronic condition where you have continuous symptoms, like heartburn that occurs two or more days a week, or damage to the esophagus. Everyone at some point actually experiences GERD. The difference is that the regurgitated liquid from the stomach contains more acid and it remains in the esophagus for a longer period of time. This acid is also more likely to remain in the esophagus longer when the reflux occurs at night. This is most likely because the person is lying down, so the acid is less likely to flow back down into the stomach, causing that burning sensation or damage to the esophagus.